Thanks, Waterloo, SC, for your purchase! 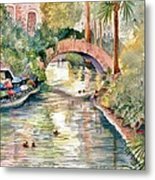 Thank you to the buyer in Tampa, FL for purchasing a print! Many thanks to the customer in Indianapolis, IN for purchasing a print! A huge thank you to the buyer in San Antonio, TX for purchasing a print today! Many thanks to the buyer in Waterloo, SC for your recent purchase. Congratulations on your sale Marilyn. 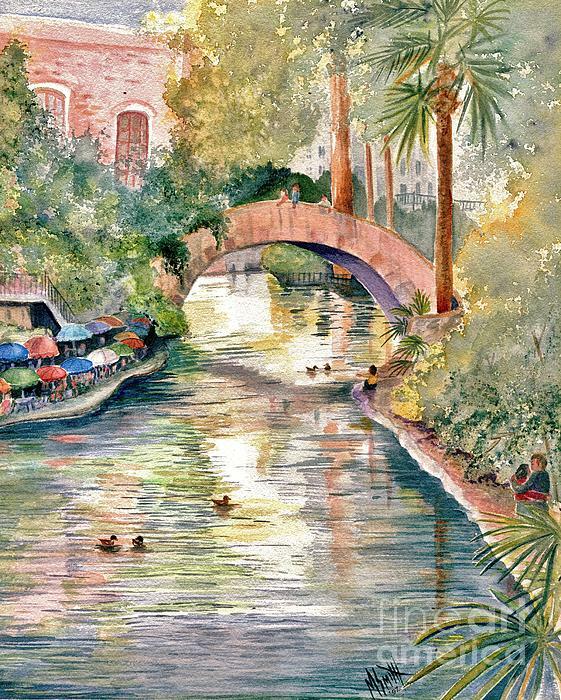 Thank you to the buyer in Scottsdale, AZ for purchasing a print of San Antonio Riverwalk! 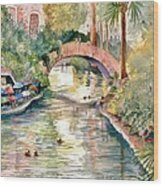 Thank you so much to the buyer from San Antonio, TX for purchasing a wood print of this painting! 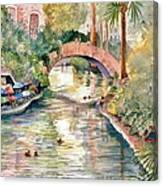 Many thanks to the buyer in Dallas, TX for purchasing a print recently!! Beautiful, Marilyn! Congratulations on your sale! 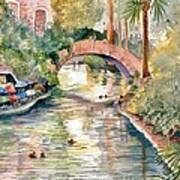 This is part of the San Antonio Riverwalk where all the colorful patio unbrellas line the shore line next to each and every cafe or restaurant along the river. It is such a peaceful and serene place to visit and enjoy the scenery while sitting on the patio of one of the cafes. Most often there will be a tour boat floating along underneath the bridge in the painting, loaded with tourists enjoying the river trip..